First came the Tumblrs, then the think pieces, then the distinction of being word of the year. What else could there possibly be for selfies? What about a huge data project analyzing how selfies around the world differ in everything from mood to mouthgape to head tilt? Selfiecity—which compares photos from Bangkok, Berlin, Moscow, New York, and Sao Paulo—may be the largest data-driven exploration of selfies yet. Lead by Lev Manovich, a professor at CUNY, the project as a distinctly academic bent. The data visualization is accompanied by, yes, three more thinkpieces about the theory of selfies. The selfies themselves, all 3,200 of them, were downloaded off of Instagram during a nine-day period in December. Then they were sent to Mechanical Turk, where the selfies got tagged with estimated age and mood. Here are some of the main findings sorted by city. Muscovites and New Yorkers, as you might expect, are a dour bunch compared to the other the cities. 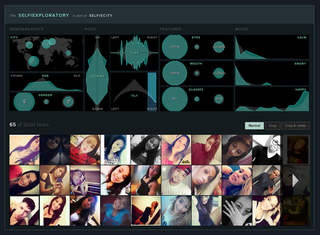 You can play with the whole dataset in the Selfiexploratory. For example, if you only want to see selfies of angry men looking up, well here you go.